When the sun goes down, many Carolina employees are just beginning their jobs. Nighttime workers include physicians in the sleep lab, housekeepers, 911 operators, faculty members researching the stars, bat flight patterns or coastal marshes, and others who sometimes work until daybreak. With daylight saving time having just ended and the night’s darkness coming earlier, staff keep the University moving through the night shift. 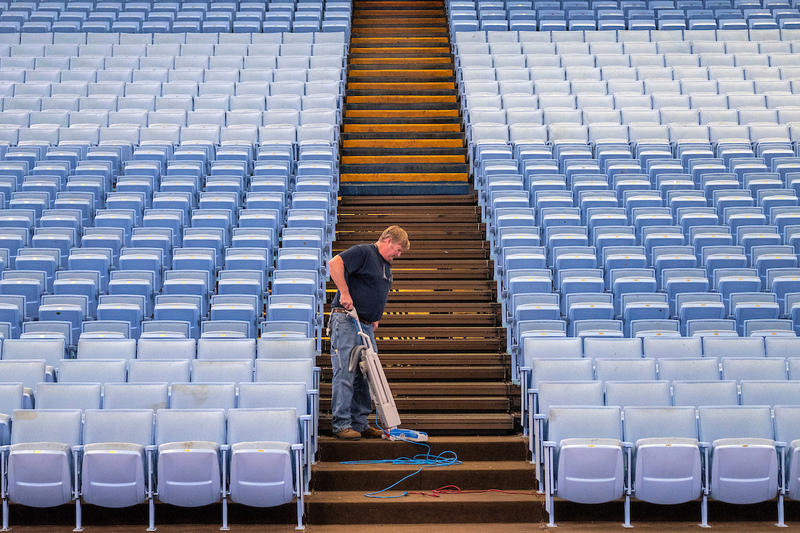 Tom Goodman, a lead electrician in Building Services, vacuums aisles at the Dean Smith Center after a men’s basketball game. Goodman is part of a seven–member crew that spends around eight hours per game setting up the floor, sound equipment, goals and seats, then monitoring and attending to problems during a game, and afterward re-setting the arena for practice. Read about other University employees who work around the clock in the November 14, 2018 issue of the University Gazette.